Disclaimer: I watched this movie without having watched all the preceding Marvel Cinematic Universe episodes, which means that I didn’t scream with excitation each time a familiar character appeared on screen and will discuss the merits of this movie alone, unfortunately. Also, spoilers ahead. Avengers: Infinity War is a peculiar movie in that it should have been called “Thanos: The Movie”. Out of all the characters appearing in this movie, he’s the one getting the most screen time and especially the most character development. It is understandable given that all the others have had their own movie(s), but it immediately flip the narrative on its head. We learn his motivations to wipe half of the sentient life in the Universe in-depth while super heroes are depicted as meddling annoyances. One main character in the background and 20-something secondary characters. Does this make Thanos into a super-hero in his own movie? Not quite. Usual super-hero movies are loosely cut into three acts, the exposition, the crisis, and the resolution. The latter act generally comes from a character transformation, because super powers alone weren’t enough to solve the crisis. Avengers: Infinity War, on the contrary, is just one long drawn-out act where Thanos keeps getting what he wants without any significant hurdle. There aren’t any crisis he would have to overcome outside of his super power which is presented as an unstoppable will. Many a time, super heroes even seem to shoot themselves in the foot, which makes them akin to traditional villain figures committing mistakes favoring the hero, in this case Thanos. 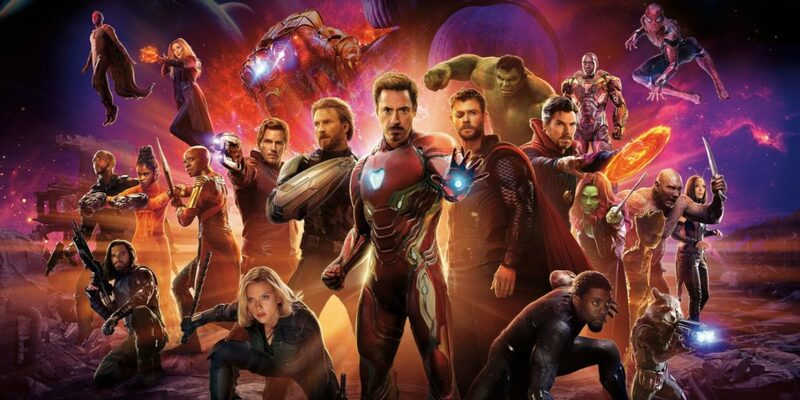 Some of these apparent blunders might be a hint at a larger scheme that will be detailed in the upcoming 2019 movie Avengers: Endgame. But since this movie is told from Thanos’ standpoint, it doesn’t end in a thrilling cliffhanger but in a proper resolution when he achieves what he directed his whole life towards, even shown smiling at the end. No upcoming movie is necessary, the narration is complete. No world can support the current amount of people living on them. All worlds would be better off with half their population. Someone has got to do something about it, no matter the cost. The latter is the linchpin of Thanos’ motivation but wouldn’t be so bad if the two former weren’t utterly wrong, leading to a horrible outcome. And the reason they’re wrong is because they seemingly have been extrapolated from few examples, two of them are shown in the movie: Thanos’ home world, depicted ruined after failing to heed Thanos’ warnings, and Gamora’s home world, from which Thanos kidnapped her as her daughter, said to be prosperous after Thanos’ army slain half the population. It’s a little preposterous to think it is either necessary or warranted at the Universe scale, but here we are, with a misled dispassionate view of genocide and well-meaning people unable to stop it from happening. The worst social justice warriors ever. I don’t think it is a coincidence this line of thinking made its way into a blockbuster movie in 2018. We are on a downward economical trend worldwide and nostalgia is running wild, creating multiple scapegoats (Muslims, Jews, Migrants, Women, LGBTQ people) somehow considered responsible for the decline. Thanos doesn’t directly assign blame, but his taking matters into his own hands clearly shows he doesn’t trust anyone living to do the right thing towards sustainability. And somehow killing half of them would solve the issue, which shows a shortsightedness even the worst conspiracy theory can’t match because Thanos is actually acting on it at a massive scale. And even if he was right, it isn’t up to him to sort it out; in the absolute half of the sentient beings don’t deserve to die so that the other half can live in prosperity. And again, it wouldn’t be so bad if Thanos didn’t succeed in his own movie. Villains often exhibit wicked or misled morals, but their ultimate defeat by better morals championed by the heroes shows how wrong they were. No better morals can be found in this movie to successfully challenge Thanos’, ultimately vindicating his philosophy clearly closer from conservative politics than progressive ones. A long time ago I used to wish for movies where the villain wins, as an edgy counter-point to lookalike stories with do-goody heroes who only seem to win because of negligence on the villain’s part. Avengers: Infinity War is a well-made “villain wins” story and made me realize how little we needed such a dangerous, amoral and ultimately bland narrative.